In order to promote contact between companies, international organizations and students, the Diplomatic Academy Vienna – Vienna School of International Studies and its alumni organization ClubDA organized a joint da.link career day on March 13, 2019. 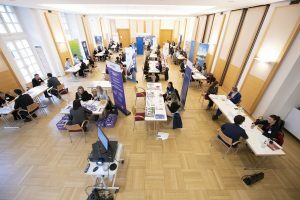 The target group of this event – students as well as graduates of the Diplomatic Academy Vienna – could inform themselves about entry opportunities, internships and summer jobs at various companies and international organizations. WEC Austria – represented by the general secretary and two employees – provided information on participation in the Young Energy Professionals Programme (YEP) and also offered project-related internships at the Vienna office location.